I googled “things to do in Virginia” and the LOTUS popped up. It is literally out in the middle of nowhere, through lots of winding rural roads, between Charlottesville and Lynchburg. But once you get there, it is a sight to see! Make sure you have GPS otherwise you’ll get turned around (as I did when the car GPS tried to take me a different way than the phone GPS suggested). In a world so full of hate, this is a sentiment I can stand behind. I’m not sure what is up those steps, but I wasn’t in the mood to climb up to find out! I did walk to the shrine and go in though. The things I do for kittens! 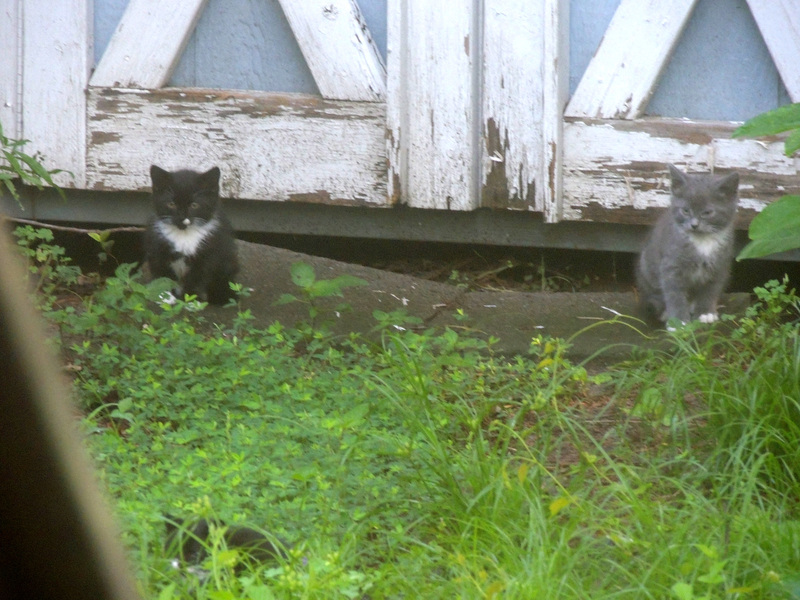 It’s another year and I have another liter of kittens in my backyard. I saw them playing on Saturday and I quickly made a plea to my family asking if they would be willing to foster them until I could get them fixed and adopted out. My two boys would not be pleased if I brought them in the house, so I needed to find somewhere else to take them. Thankfully, they agreed! And even agreed that they could handle six of them! After careful review of all photos taken that day, I think there are actually 8 (some of the markings are different). But after showing them these cute little faces, how could anyone say no!?! I’ve caught two so far, and will chronicle their stories separately as they will more than likely become permanent additions to the family. 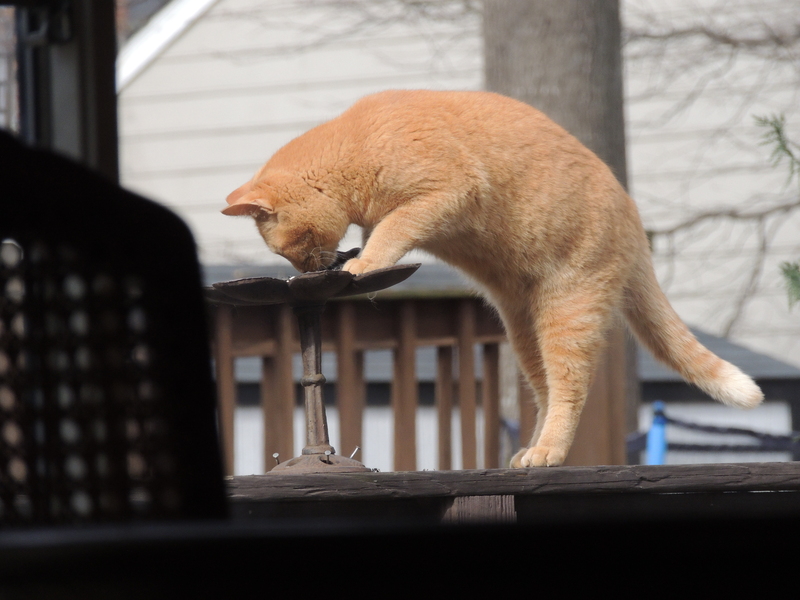 The last post I wrote about doing things for cats described me crawling around under my house to make sure feral cats weren’t living under there (https://anyonecantakeapicture.com/2013/03/10/the-things-i-do-for-cats/). I do things for cats, all cats, because I love them. Stinky, smelly, cute, cuddly cats. 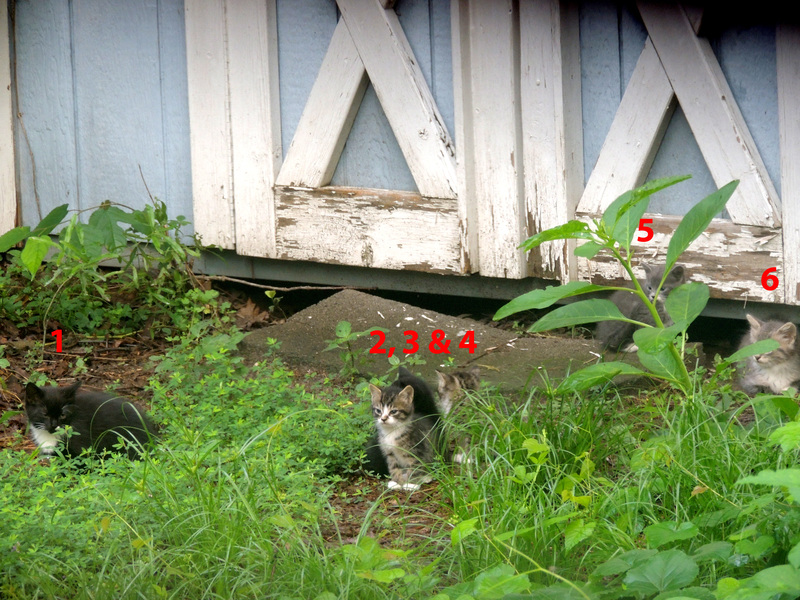 Shortly after that last post, I started participating in a humane feral cat program called Trap-Neuter-Return. I learned about it from an organization called Ally Cat Allies (http://www.alleycat.org/). 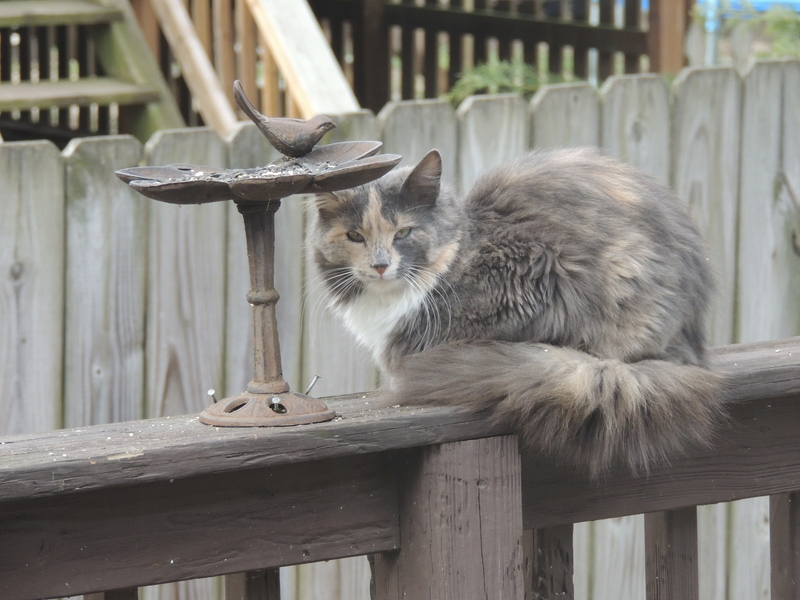 They are a wonderful organization that not only promotes the well-being of cats, but also educates folks, like myself, on how to deal with feral cats, humanely. 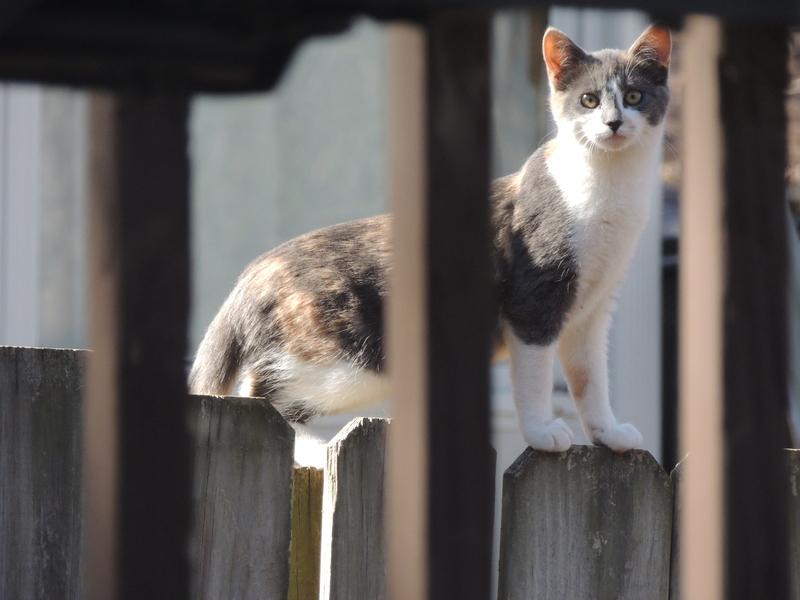 So, in order to help reduce the feral cat population in my neighborhood and to help these cats live better, healthier lives, I made some appointments and trapped a few of them. The first one was a pretty little girl cat. I’m glad she was my first because the next two were scary! While she was in surgery, the vet discovered an injury to her tail, which ended up having to be partially amputated. 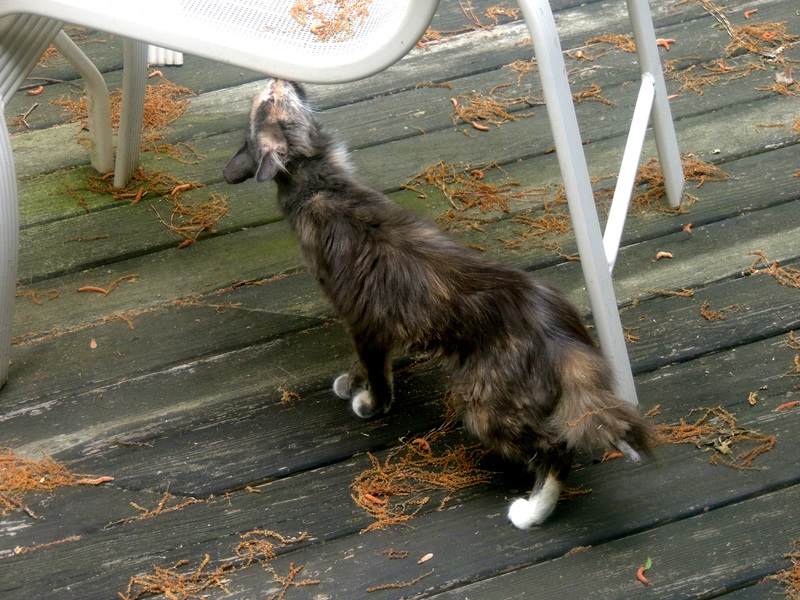 But, she showed up the very next day to visit me, so her journey must not have been that traumatic. 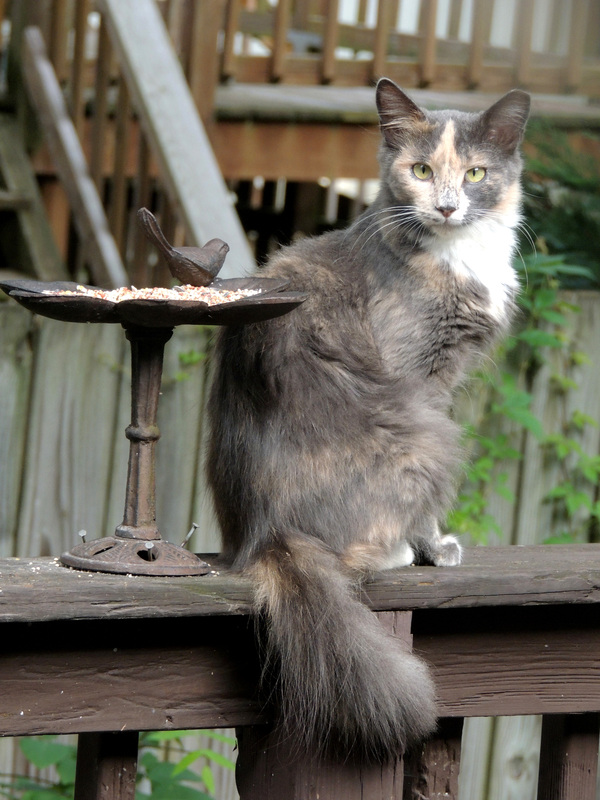 Part of the TNR program also involves clipping, or tipping, the very tip of their left year so that others know the cat has been fixed. 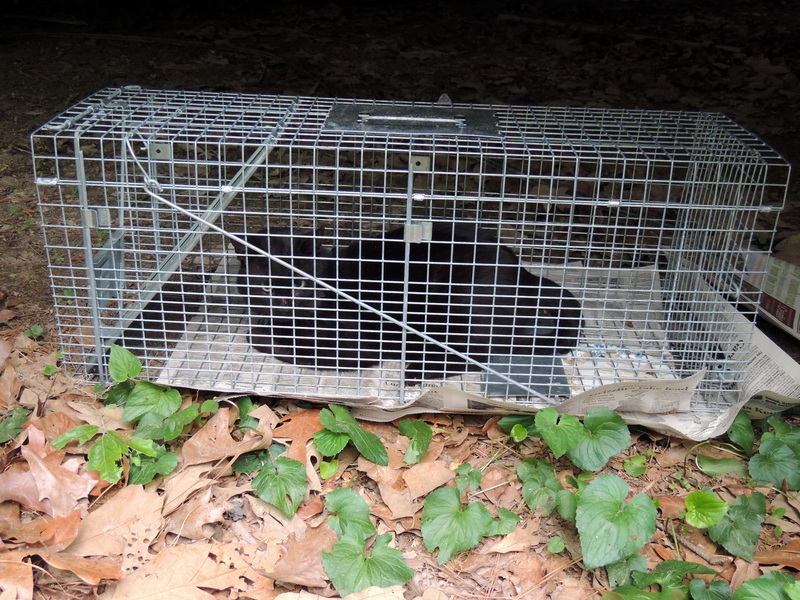 With one successful trapping down, I made another appointment. This guy was not very nice. 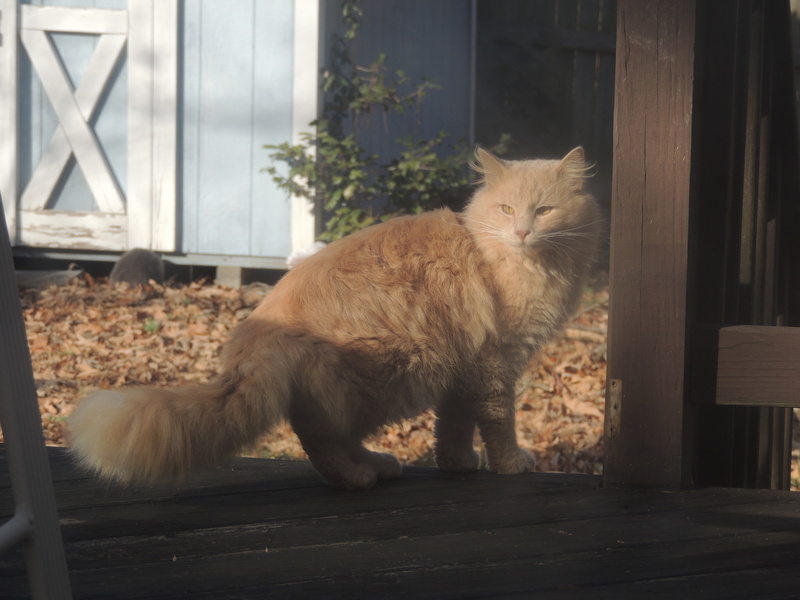 I had seen him fighting with other cats so I expected him to be vicious, but he only hissed and tried to claw me a few times. The next one was even worse. He constantly charged at me while in the cage, clawed to get out (can’t blame him for that), and was just overall unpleasant to deal with. But, I did my part. One female and two males were sterilized and helped reduce the endless cycle. All three of them were fixed in May of last year (2013). I saw them for a few months afterward, but not since. They may have gone to other houses, may have been caught and not released, or may have passed. 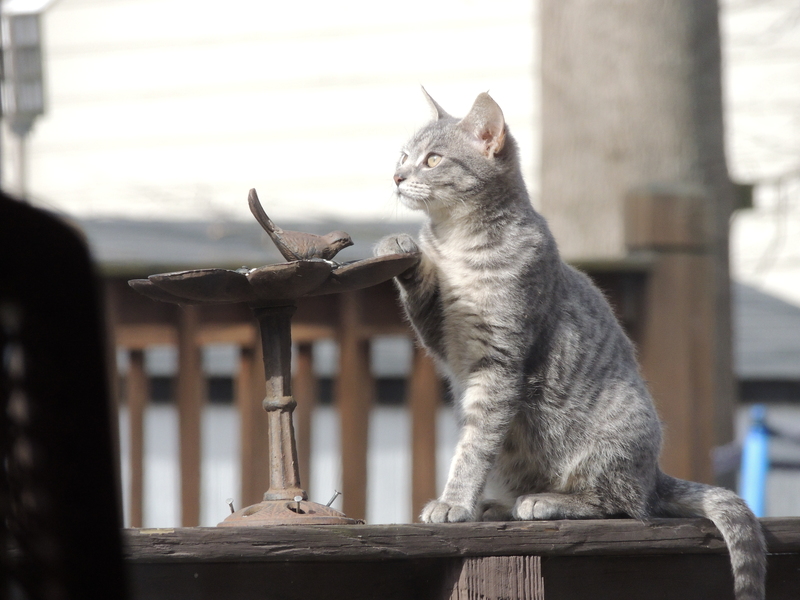 But each year, more and more kittens show up in my backyard, and I do what I can to help control the population. 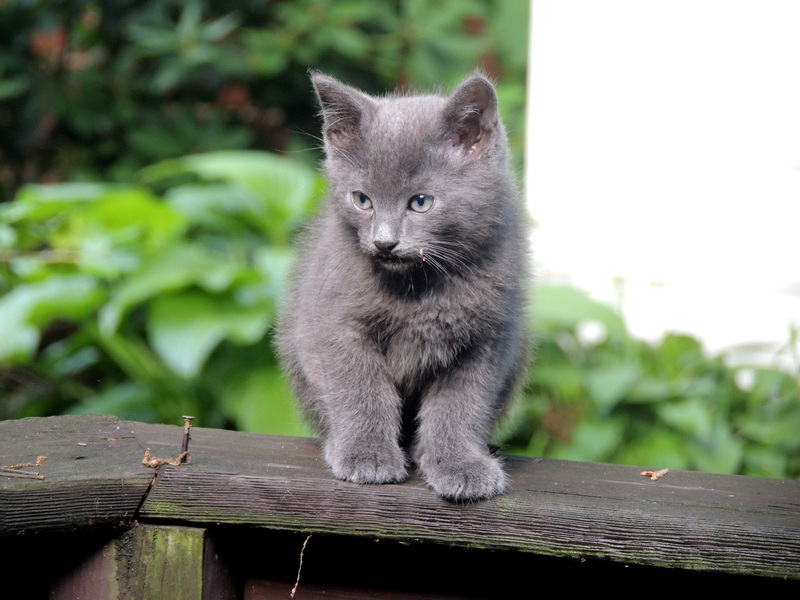 Which leads me to my next post…on kittens! …even when they aren’t my pets. 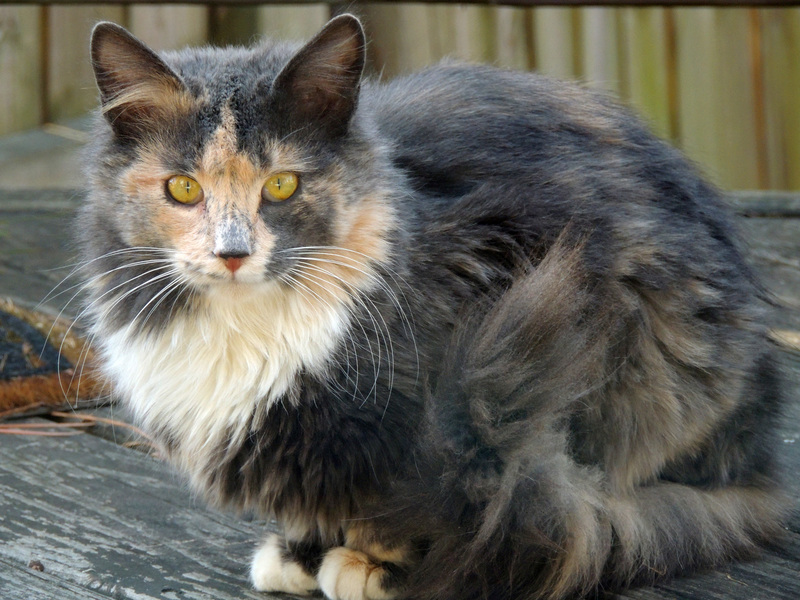 My neighborhood has become inundated with feral cats. It’s not like I live out in the boonies or the sticks where there are lots of wide open spaces. It’s a normal community, older houses, mature trees. Just lots of cats. 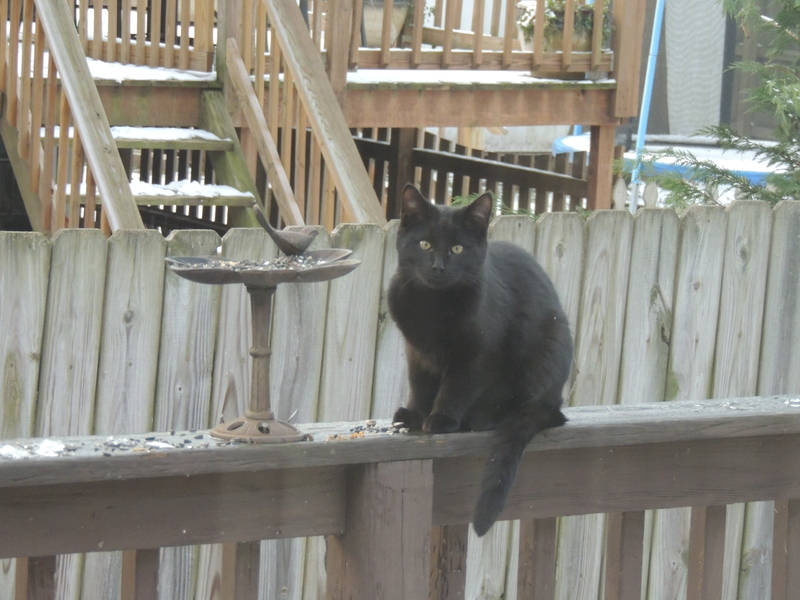 I think a neighbor moved out, left their outdoor cats to fend for themselves, and two years later we have 30-40 cats running around. But how can you not like these cute, sweet faces?? Well, I’ll tell you when they aren’t cute. When the tom cats start fighting at all hours of the day/night, when they spray your welcome mat and glass doors and when they start accosting the little female kitties. And it’s also not cute when they find a way into the crawl space under your feet. The last straw was when I heard a cat fight, literally a foot away from me, but from underneath me. 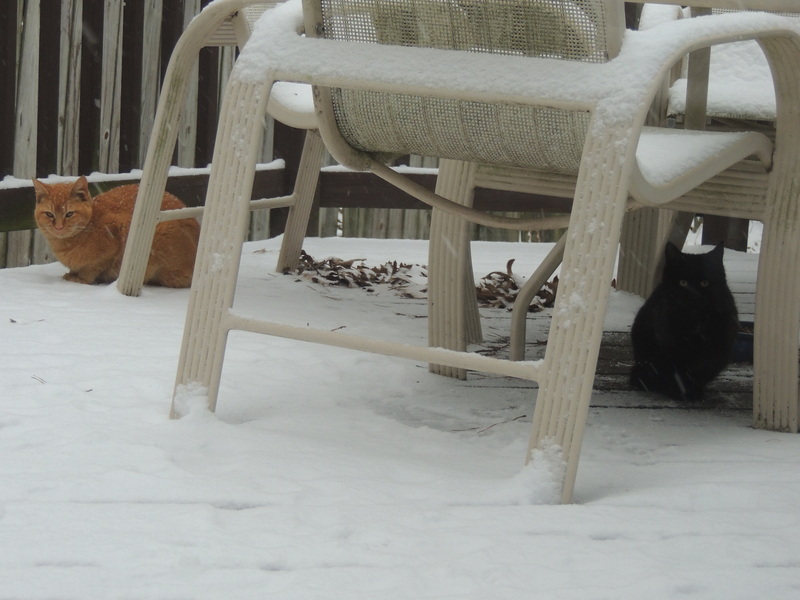 And my two (indoor only) cats were sitting right in front of me, snoozing. So it couldn’t have been them. 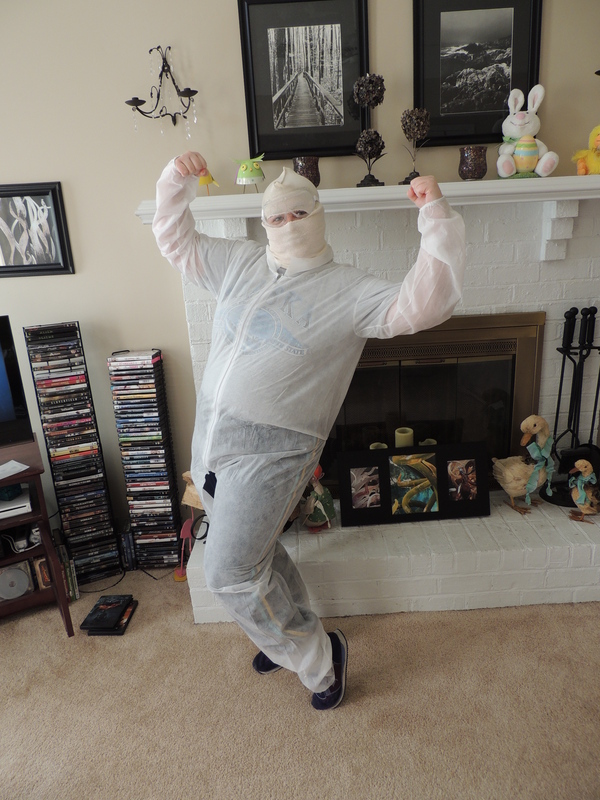 I immediately went out and bought what I had been calling a hazmat suit, but really it was just a painters’ jumpsuit. I also bought a mask/hoodie thing to protect my hair. 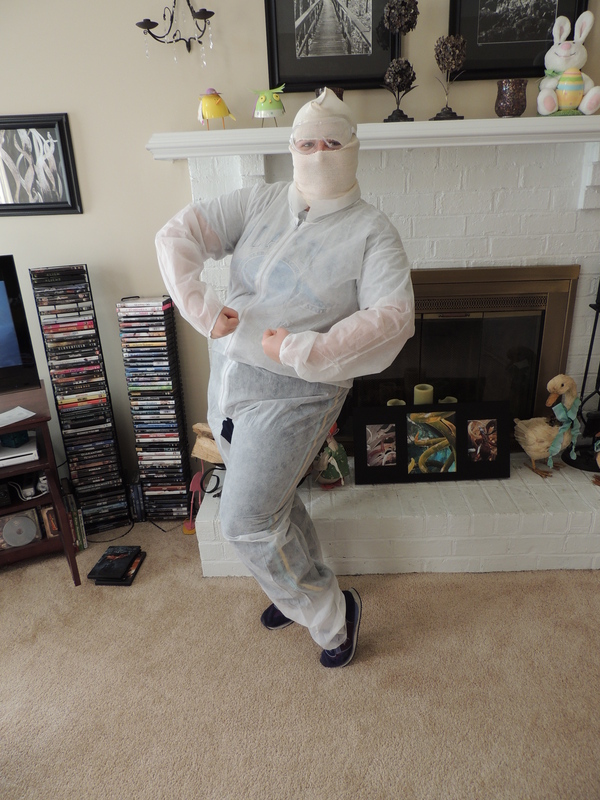 I had some cheap goggles and gloves from a Halloween costume that rounded out the ensemble. 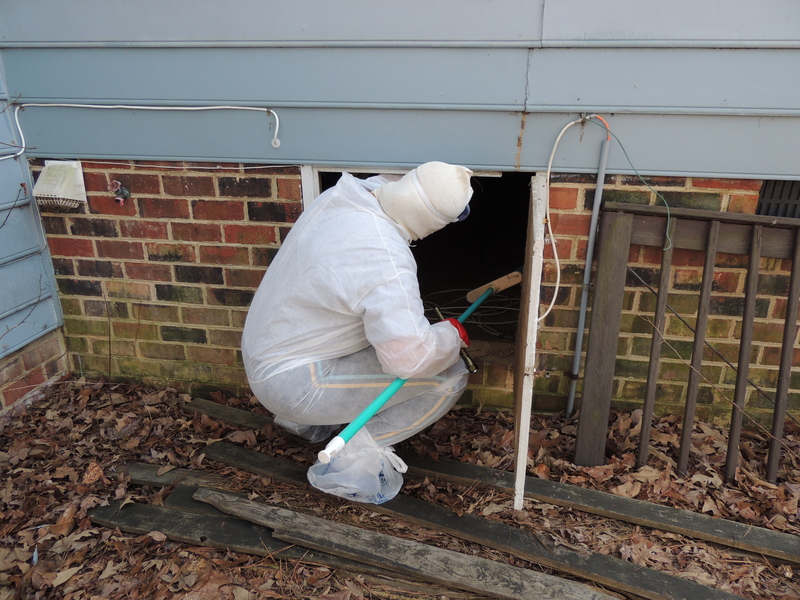 Only thing left to do was to wait for a warm day to ensure the cats were out of the crawl space enjoying the sunny day. That day was today. I donned my hazmat suit, hoodie, goggles, gloves and tied bags around my shoes. I was ready! 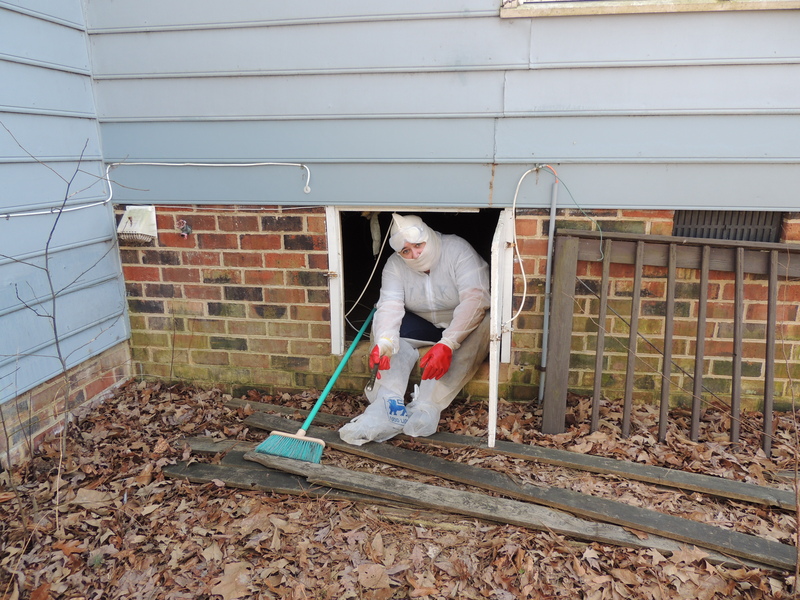 Here I am psyching myself up into crawling into the crawl space. I really, really didn’t want to do this, but knew the only way to confirm what was really going on down there, and to really know for sure none of them were still under there before I blocked the hole, was to just get down and dirty. It reeked of cat pee, but actually wasn’t as bad as I thought it was going to be. 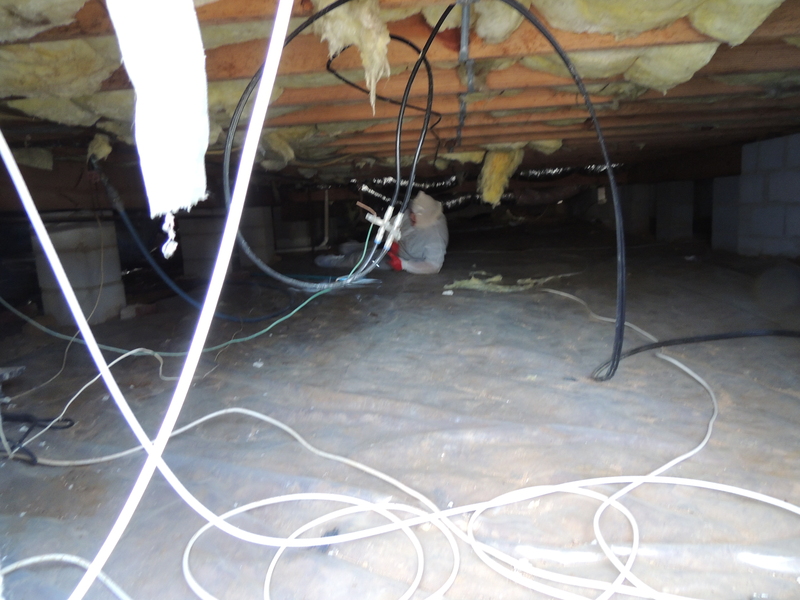 There was some insulation that had come down, but all in all was relatively clean, for a crawl space. I found one dried cat poopy and that was it. 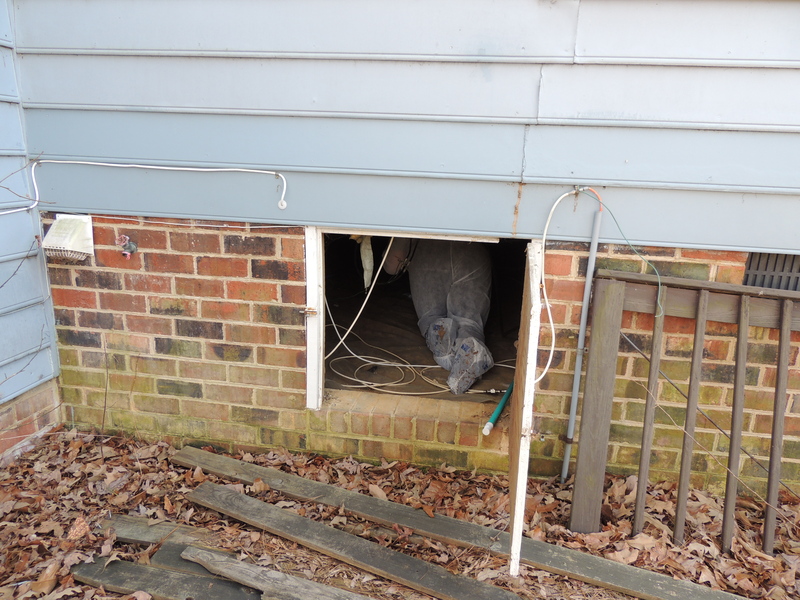 I did find one of the insulated vents hanging down, so I resecured it to the main vent. I’m guessing that was the metallic banging I was always hearing as well, they have actually been crawling around in the vents! Having staked out the whole space and as satisfied as I could be at that point, I headed back out for some fresh air! The hole is now completely blocked up, I’m just really hoping I was indeed able to scare all of the cats out, if there were any in there. I guess time will tell. If I hear any more noise, I’ll know something was trapped. If I don’t, then this dirty, smelly chore was a success! 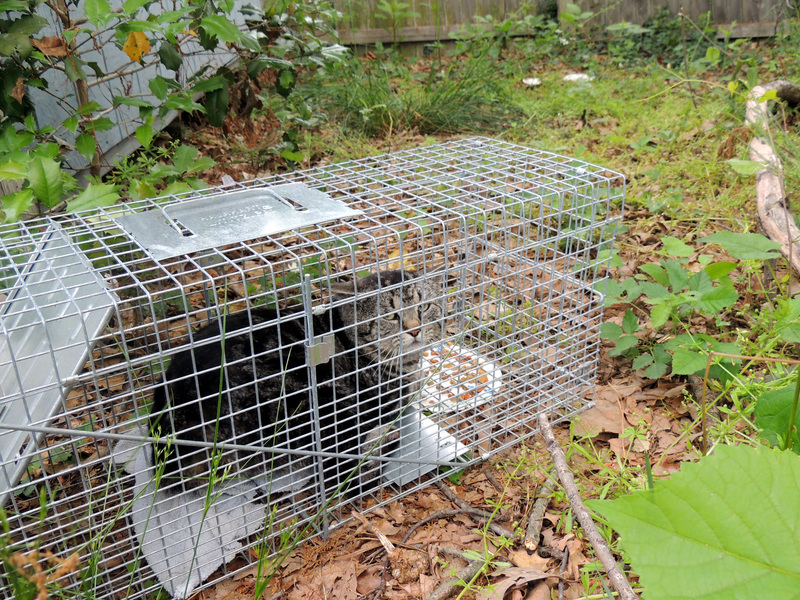 Next on the list, Trap-Neuter-Release! I have 4 appointments in the next couple of months, I just hope I can actually catch them and fix them so they don’t keep repopulating the neighborhood!